CURVE, Pa. - The Altoona Curve announced another addition to the 2019 promotional calendar on Tuesday with a seven-game team rebrand series, complete with a new team name and uniforms. These one-of-a-kind alternate uniforms will be on display for the first time on Saturday, January 26 during PiratesFest at PNC Park in Pittsburgh. "One of the trends in Minor League Baseball over the last few years have been changing team names or rebranding for a period of time that ties into the market," said Curve General Manager Derek Martin. "Most teams have changed their names to food items and I wanted to be different. "When I was watching the Steelers game the day after the tragic shooting in Pittsburgh, Bill Cowher talked on the CBS broadcast about how Pittsburgh is a tough community and everyone would come together because we are "Yinzer Nation". After about the tenth time that Cowher said 'Yinzer', I knew we needed to do something revolving around Yinzers." Martin expects third-year field manager Michael Ryan to be particularly invested in the uniforms that will be worn for 10 percent of the team's home games in 2019. "With Michael coming back this year as a Western Pa. native and a Pittsburgh resident, our longstanding relationship with the Pirates, I thought this is the perfect time to launch this promotion." The first time the Curve take the field as the Yinzers will be Saturday, April 13, the first Saturday home game of the season. The unique Yinzers jerseys, presented by Keller Engineers for the 2019 campaign, will be auctioned off after the final night of the promotion on Thursday, August 8. A portion of the proceeds from the jersey auction will benefit the Roberto Clemente Foundation. 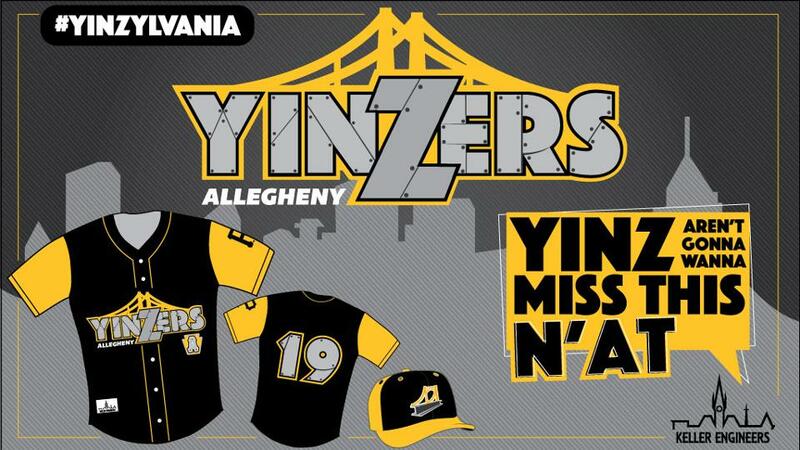 All seven dates for the Allegheny Yinzers uniforms include: April 13, May 31, June 13, June 29, July 6, July 26 and August 8. To bring those promotional nights to life, the Curve will also host various Pittsburgh celebrities that will be announced with the full promotional calendar at a later date. *The current Snowfall Sale is not applicable to presales on the Yinzers merchandise. Season Tickets, Mini Plans and Flex Books are currently on sale by phone at 877.99.CURVE, online at AltoonaCurve.com or in person at the PNG Field offices. The Stockyard Team Store is open Monday-Friday from 9 a.m. to 4 p.m. and online 24/7/365.